How Much Of A Battery Pack Does Your Electric Car Need? [Elon Musk] recently staged one of his characteristic high-profile product launches, at which he unveiled a new Tesla electric semi-truck. It was long on promise and short on battery pack weight figures, so of course [Real Engineering] smelled a rat. His video investigating the issue is below the break, but it’s not the link that caught our eye for this article. As part of the investigation he also created an online calculator to estimate the battery size required for a given performance on any electric vehicle. It’s not perfectly intuitive, for example it uses SI units rather than real-world ones so for comparison with usual automotive figures a little mental conversion is needed from kilometres and hours to metres and seconds if you’re a metric user, and miles if you use Imperial-derived units. But still it’s a fascinating tool to play with if you have an interest in designing electric cars or conversions, as you can tweak the figures for your chosen vehicle indefinitely to find the bad news for your battery pack cost. It’s very interesting from a technical standpoint to see a credible attempt at an electric truck, and we hope that the existing truck manufacturers will show us more realistic prototypes of their own. But we can’t help thinking that the overall efficiency of electric long-distance trucking could be improved hugely were they to make a truck capable of hauling more than one trailer at once. Any safety issues could be offset by giving these super-trucks their own highways, and with such dedicated infrastructure the power could be supplied from roadside cables rather than heavy batteries. In such circumstances these long trains of electrically hauled containers could be rather successful, perhaps we might call them railroads. Seeing a half car is always a disconcerting experience. Especially when that half car is about 14 feet up in the air. [PanasonicModelRC6015] — We’ll call him [RC6015] for short — has gone and mounted 1/2 (actually more like 1/4) of a VW Rabbit Caddy pickup MK1 up on his shop wall. The caddy started life as a regular 1983 VW pickup. Unfortunately, the years had not been kind to it. The body panels were in good shape, but there were serious rust problems in the floors, strut towers, rockers, and control arm mounts. According to [RC6015], this is beyond “weld on few replacement panels”, though he’s been heavily questioned on it in his Reddit thread. Cutting the truck down was easy – a reciprocating saw did most of the work. The VW has a unibody design, so there was still some frame there to hold things together. A 2×12 board then was then bolted from the front of the truck to the rear. This made everything stable and provided a solid mounting point. A second 2×12 was lag bolted to several studs on the wall. Then it was just a matter of lifting the truck into position and bolting the two boards together. We’re guessing the [RC6015]’s wall has solid wood studs. Don’t try hanging a 500 lb truck from the wall if you’ve only got thin metal studs behind your sheetrock. Just in case you’re wondering, the Panasonic Model RC-6015 is a vintage flip display alarm clock, the same one Marty used in Back to the Future. If a truck on the wall is a bit much for your shop, check out this wall mounted weather display. Seems like all the buzz about autonomous vehicles these days centers around self-driving cars. Hands-free transportation certainly has its appeal – being able to whistle up a ride with a smartphone app and converting commute time to Netflix binge time is an alluring idea. But is autonomous personal transportation really the killer app that everyone seems to think it is? Wouldn’t we get more bang for the buck by automating something a little more mundane and a lot more important? What about automating the shipping of freight? Look around the next time you’re not being driven to work by a robot and you’re sure to notice a heck of a lot of trucks on the road. From small panel trucks making local deliveries to long-haul tractor trailers working cross-country routes, the roads are lousy with trucks. And behind the wheel of each truck is a human driver (or two, in the case of team-driven long-haul rigs). The drivers are the weak point in this system, and the big reason I think self-driving trucks will be commonplace long before we see massive market penetration of self-driving cars. The Open RC Truggy that started it all. 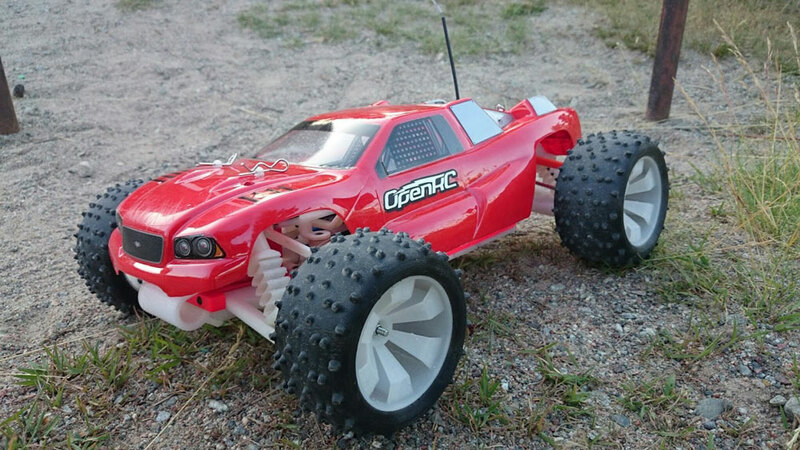 After releasing his second design, the OpenR/C Truggy, he realized a community was forming around this idea, and needed a place to communicate. So, he created a Google+ group. Today, the Truggy has been downloaded over 100,000 times and the Google group has over 5,000 members. It’s a very active community of RC and 3d printing enthusiasts who are testing the limits of what a 3d printer can do.